It is not just with regard to hiring, but how firms promote, retire, and retrench their staff that could trigger additional scrutiny under the government's Fair Consideration Framework. Firms will be flagged if there are repeated complaints of unfair human resource (HR) practices across the employment spectrum, and not just at the hiring stage, Acting Manpower Minister Tan Chuan-Jin told Parliament yesterday. "Employers will be identified for additional scrutiny based on a range of factors. We will consider how a firm's proportion of Singaporean PMEs (professionals, managers and executives) compares with others in the same industry. "Other factors such as how fast the proportion changes over time, which could be due to promotion or retirement or retrenchment patterns, are also relevant," said Mr Tan yesterday. The Fair Consideration Framework aims to ensure that Singaporean professionals are fairly considered for jobs, and takes effect on Aug 1 next year. Under new rules, employers will have to advertise job vacancies on a new national jobs bank for two weeks before any applications for employment passes for PME jobs will be accepted. While HR specialists that BT spoke to broadly welcomed the government's intent to consider post-employment procedures, they cautioned that implementation could prove tricky. Said Annie Yap, group managing director of AYP Associates: "Overall I think this is a good move, because it will make employers focus on the Singaporean employee market first. "But there are some issues with feasibility, because it must be implemented in such a way that Singaporeans feel they still need to work hard and prove themselves." Meanwhile, Human Capital Singapore chief executive Ho Geok Choo noted that "promotion is always an outcome or a function of several factors", and must inevitably go beyond nationality. "Say, for example, an executive from Myanmar gets promoted over a Singaporean, even though the Singaporean is more qualified for the job. And the reason is because the company is making a strategic decision to penetrate the Myanmar market, and open up business opportunities there. You can't say this is unfair, because there are many considerations at play when promoting someone." Still, both Ms Yap and Ms Ho agreed that the government's efforts to enhance the Employment Act should be applauded - including its desire to take post-employment procedures into account. Even so, Mr Tan was quick to emphasise that while the Fair Consideration Framework signals acceptable norms in HR practices, it is not intended to ensure that "every single PME job goes to Singaporeans". "I think we do need to ensure that the economy remains competitive and that is probably the best way to look out for the interests of all Singaporeans. Employers are best placed to decide which candidates can do the job. What MOM (the Ministry of Manpower) will do is to signal these expectations quite strongly and clearly, and importantly to monitor the firms' HR practices," said Mr Tan. "So that's something we're firmly committed to. But being open, dynamic, and diverse does not mean that you cannot ensure that fair consideration takes places as well. And we accept that some element of that might have crept in some sectors of the economy. And that is why the signalling has been taking place - we've been speaking to different sectors, and they've been responding," he added. Mr Tan also explained why MOM has allowed companies with fewer than 25 employees, or ones proffering jobs with salaries above $12,000, to be exempted from advertising on the jobs bank. This is because such small firms employ only around 25 per cent of all Employment Pass (EP) holders, while jobs paying more than $12,000 a month cover just 5 per cent of the local workforce. Hence, most jobs would be covered by the new requirements, as will the vast majority of new EP applications. 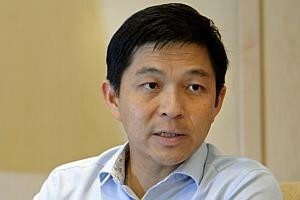 "While there are some exemptions to the advertising requirement, let me reiterate that there are no exemptions to the need for firms to consider Singaporeans fairly," said Mr Tan, adding that MOM will impose greater scrutiny on wayward firms, whether they are small or have all jobs paying above $12,000. Even though MOM is not expecting firms to work towards a target percentage of Singaporean PMEs in its workforce - especially since this can vary across and within industries - Mr Tan said that the government has its own "internal thresholds". If these are breached, they would trigger MOM to "take a closer look" at potentially offending companies if need be. In response to a question from NMP Teo Siong Seng, Mr Tan said that MOM is "more than open" to considering how it can collaborate with private jobs portals. "They are obviously concerned, (and) we will be quite happy to work with them, and to consult with them in the months ahead to explore possible areas of collaboration that can improve the overall labour market efficiency and provide as much visibility of job opportunities to job-seekers as possible," said Mr Tan.